Introducing GameSir GK100, the authentic one-handed mechanical gaming keypad for Windows PC and GameSir X1. Each key is precise and placed at the perfect position with the instantaneous response. The new gaming experience awaits. The connection can't be easier. Wired connection and no drivers needed. Simply plug it to the PC or GameSir X1, it will be automiactically recognized and ready to use. 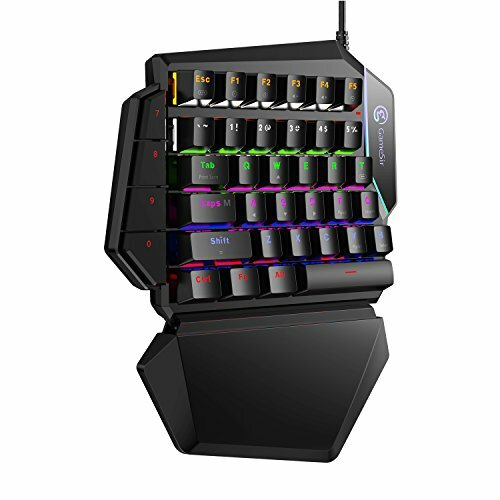 GameSir GK100 is equiped with 34 keys with professional gaming mechanical blue switches. No conflicts, no ghosts. The clicky tactile feedback really brings yout the true joy of every hit! The 4 side keys are also fully programmable to any hotkey, key combination and macro for fast command. We added some tweets for better gaming experience! Turn on the Arrow Key Mode to enjoy the secondary key function plan for gaming! For example, CAPS key will be replaced as Map button automactically in games like PUBG, F1-F5 was also added to go through building options or place traps in Fortnite! The palm-rest is adjustable and detachable. It allows you to slide it to any position for the best ergonomic options. Pull it to the left to be detached and push it to the right to install back. Enjoy the colorful key backlit effect with 8 pre-configated profiles and the LED light bar on the right side of the unit. The backlit is adjustable in colors and brightness, select your favorite lighting configuation! Easy to Use, Plug and Play: Wired connection and no drivers needed. Simply plug it to the PC or GameSir X1, it will be automiactically recognized and ready to use. Mechanical Blue Switches: 34 keys professional mechanical blue switches, No conflicts with 4 side keys are fully programmable to any hotkey, key combination and macro for fast command. Optimized Key Functions: Turn on the arrow key mode to enjoy the secondary key function plan for gaming. Specifically for PUBG Fortnite battle royale games! The Sliding-Rail Style Palm-Rest: It allows you to slide it to any position for the best ergonomic options. Color LED Backlighting: Enjoy the adjustable colorful key backlit effect with 8 pre-configated profiles and the LED light bar on the right side. If you have any questions about this product by GameSir, contact us by completing and submitting the form below. If you are looking for a specif part number, please include it with your message.